Tora Berger could claim the title of World Champion over the weekend, when she won her first individual gold medal in the International Biathlon Union’s competition at Ruhpolding in Germany. She also revealed that she won an even more important battle three years ago, against skin cancer. Few knew that the 30-year-old Berger faced the challenge of a lifetime just a year before she also won gold at the Winter Olympics in Vancouver in 2010. On Sunday, just after winning her third gold medal at the IBU World Championships, she told Norwegian Broadcasting (NRK) that she had to undergo surgery for skin cancer in 2009, and was told the cancer that was removed was malignant. It was caught early though and Berger, who declined to go into detail about her recovery and treatment, said she still has regular check-ups. She admitted to NRK, though, that she was scared. 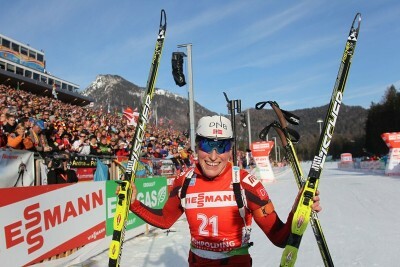 She triumphed Sunday in the 15-kilometer individual race, skiing and shooting in 42 minutes and 30 seconds with one penalty. She beat Marie Laure Bruent of France, who claimed the silver medal, and Helena Ekholm of Sweden, who won bronze. The Norwegian men didn’t do so well on the last day of the world championships. Tarjei Bø started off strongly but fell and couldn’t recover. Emil Hegle Svendsen had been favoured but ended in 18th place, and the men went home without an individual gold for the first time in eight years, reported newspaper Dagsavisen. They did grab gold in the mixed relay, though, where the team included Berger. Meanwhile, in Nordic World Cup action at Holmenkollen in Oslo on Sunday, Marit Bjørgen won the women’s 30-kilometer race and said she thought it was her “best tremils race ever,” referring to how the Norwegians call 10 kilometers a mil, so tremils equals 30K. Bjørgen seems destined to win the overall World Cup this year. She won the World Championships last year.